From now you have a wide range of rental 4 x 4, vans, minibuses with Spanish speaking driver in Morocco. Discretionary transportation services. All-terrain rental with and without driver. Coverage in Tangier, Fez, Marrakech, Casablanca, Rabat, Tetouan and Ouarzazate. 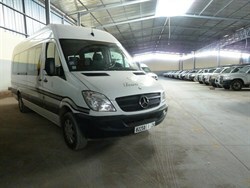 We carry out all types of transport service in Morocco. Just ask for a quote, you will have a response in a minimum of time. Enjoy our great experience in the sector, which allows us to guarantee total security and quality at very competitive prices. You will have at your disposal professional drivers, with a long history and experience in the tourist transport service, with permanent training to offer a quality service with efficiency, effectiveness and safety. If you ask them to speak Spanish, we can also provide them to you. Our vehicles are fully equipped for tourist transportation throughout the country; With panoramic windows, air conditioning, ventilation, ambient music or whatever you prefer, adequate seating arrangement for your comfort and enough space for luggage. 24-hour telephone service. From before your arrival in Morocco you will have a Spanish and a Moroccan mobile number that you can call at any time for your peace of mind. Also, of course, you will have the driver's cell phone. Ask for anything specific in Morocco: Vans, minibuses, buses, transfers, visits, excursions, special events and 4 x 4 rentals with and without driver in Morocco. We work with companies, travel agencies, embassies, consulates, colleges and universities, tourist programs, congresses and conventions. 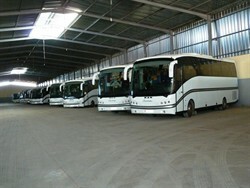 We are specialists in transport in Morocco. Whether you are a large group or not, do not hesitate to get in touch with us. If you want a quotation of 4x4 SUVs, vans or buses in Morocco, send us an e-mail to Traveltomorocco.tours Tell us what you need and we will respond as soon as possible.